A few weeks ago in my Target-Date Funds (also called Lifecycle Funds) blog, I outlined some of the advantages and potential problems with them. I promised to look at a simple model that you may choose to use to implement your own custom Lifecycle/Target Date Fund using existing ETFs. In “Lifecycle funds: Taking a balanced approach to savings” Avi Nachmany is quoted “Too often investors left on their own are too passive, too lazy, too ignorant or too greedy and so they make bad choices,” he adds. “With these funds investors know they are doing the right thing rather than just buying the stock of the month.”. He believes that Lifecycle funds have staying power. If you are an American who has access to one of the low-cost versions of these funds and Mr. Nachmany’s description applies to you, then by all means they will do the job for you. If you are a Canadian, given the cost of the available lifecycle fund, or an American/Canadian who would like to overcome some of the problems mentioned, I will describe a model that you could experiment with to arrive at a customized solution that is right for you. You must consider the drag on your returns, associated with the management fees of the funds. For what it’s worth, over a 30 year retirement, the asset erosion resulting from annual fees of 0.2%, 0.6% and 2.0% is 6%, 16% and 43%, respectively. So, while U.S. based investors have a much more favorable environment in which to exercise their target-date fund options. Canadians may wish to consider an ETF based customized solution, until low cost Target-Date ETFs become available. This is partly due to the increased longevity and the corresponding fear that a portfolio with too large a fixed income component is not capable of keeping up with inflation. The international (non-U.S.) portion of each fund is about 20-25% of the stock allocation (not the total portfolio). By the way the same non-U.S./Canadian stock proportion applies to the Canadian Target-Fund offerings. 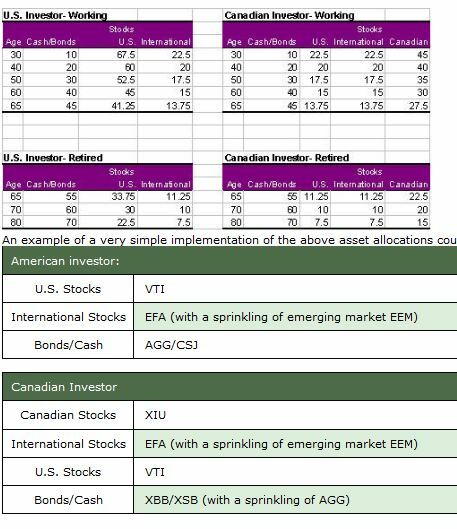 The primary difference between the allocations of the Canadian funds is that the non-international portion of the stock allocation is not purely U.S. based asset, but a mix of U.S. and Canadian stock, the U.S. proportion about the same as the international one. The allocations of the U.S. and Canadian offerings are weighted so that home based assets are adequately represented, since typically the predominant spending also occers in the home country. Another difference worth mentioning among the funds, is that Vanguard funds have typically zero cash allocation (except for 5% in the well into retirement case) while the others have 20-40% cash or short-term bonds when close to or in retirement. It is a good practice in general for people who are pre-retirement to have cash reserves of 3-6 months of expenses and post retirement to have about two years’ worth of cash or short-term bond reserves, should there be a period of significant drop in stock prices, making them painfull to liquify. So, if you are comfortable with the allocations specified by the above fund providers, then this model will get you close to the average of their allocation. All these ETFs have expense ratios below 0.35 (except EEM at 0.75%). So the overall portfolio headwind will be of the order 0.3% per year (very favorable as compared to the 1.9-2.5% for the Canadian lifecycle fund). Also using the ETF based portfolio you can place the fixed income portion of the portfolio into the tax-sheltered part. Furthermore, if you are more/less risk averse you can use a younger/older age for the calculation. So we have addressed several shortcomings of the Target-Date Funds. You can also further fine tune the portfolio with ETFs (and CEFs for foreign bonds) by adding a small amount of high-yield bonds, TIPS/Real-Return bonds, unhedged foreign bonds and/or commodities. Even a small dose of these usually help reduce volatility and/or increase returns. And, finally a postscript to the Target-Date Funds blog of a couple of weeks ago, in “When investors can’t leave their lifecycle funds alone” Jonathan Clements gives examples when some investors may be doing sensible things, even if it does not seem that way at first glance. Examples he gives are when: (1) 80% of funds goes to a Target Date Fund and 20% to emerging markets, junk bonds, etc (like in a core and satellite model that we’ll discuss in a future blog) or (2) buying both a 2010 and a 2020 fund when retirement is somewhere in-between. How do you get around paying trading fees for each of the etf’s every month? To me, this is one of the major benefits to the American Lifecycle funds – the fact that you can wave the transaction fees by signing up to automatic monthly contributions. If you have any insight into how to set up automatic contributions as an individual investor in Canada without paying trading fees, I would love to hear them. I am not familiar with American Lifecycle Funds offering. However, as you probably know, that there is no sustainable advantage to actively managed funds but costs are higher and go on forever. If you are a Canadian resident, I am pretty sure that you won’t be able to get any U.S. based mutual funds. ETFs, U.S. or Canadian based ones are of course accessible through your online broker, so you could accumulate your monthly savings in a cash account and once or twice a year, you could purchase the ETFs that you are interested in. Transaction costs are low ($10/transaction) so for a $5,000 chunk of cash you are looking at 0.2% one time cost. Pretty cheap!